Versatile Vegetarian Kitchen: Baking from a Book - Breakfast!! Baking from a Book - Breakfast!! Before anyone starts wondering what this is all about, I have to confess something. I have an obsession. I cannot resist cook books. Mainly books with baking recipes. Not that I need more books, but when I see a deal, I just get them. I probably have closer to 200 cook books and only 10 of them are Indian cook books. You see, I really didn't need to learn the basics of Indian Cooking compared to baking. I saw the oven for the first time when I came to this country about 11 years back. Hence my interest. Coming to the point, I feel bad that people rely on internet for recipes and not books anymore. I understand that there are lot of advantages of sitting at your desk and searching for the exact words instead of going to the book store or library and searching book after book for something. But, the fun is different. Even when I have so many books, I do go to the library. It is not the recipe that I look for in any book. It is a trigger to make my mind work and come up with new ideas. I do follow the baking recipe from the book but always add a touch of my own. I wanted to announce an event which will explore the cook books. Give an opportunity for you to showcase your collection. Bake anything in the month of April 2010 that can be taken as breakfast from a book. It has to be vegetarian and you can use eggs. The picture should include the front cover of the book you used and your dish. If you cannot combine them into one picture, it is alright. Send me two pictures one of the book and one of your finished product. Breakfast can be muffins, bread, Biscuits, casseroles, cereal (baked) etc. Link back to this announcement and please use the logo. It helps everyone to recognize what it is since this one is a little different. You don't have to buy the book. You can borrow from a friend, library. 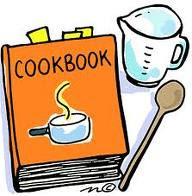 But specify the details of the book and what recipe you used. Make a note of your modifications if any. Send me an email at versatilekitchen@gmail.com with the subject 'Baking from a Book' with a picture, your name, your blog name and the recipe URL. Non Bloggers can send in their entries too. I am sure there are lots of you out there who enjoy cooking, baking as much as we bloggers do but just don't make it public. I do not want old posts. This is to encourage people to look at books. It has to be from this month and the deadline is April 30th Midnight EST. Roundup will be sometime in the first week of May. I will announce the next 'Baking from a Book' in the month of May. However, if any of you are interested in hosting this, let me know and you can choose what the topic should be as long as the rules are followed. I want to encourage people to use books which really unwinds your minds and lets your creativity come through. nice theme champa. I still have the handwritten notes and recipes from amma/Doordarshan Metro :) all dogeared but brings back good memories. I'll send an entry. How about giving me a chance to Host it? I have something for June and July, so anything after that? Sure Ruchika. Send me an email when you want to do it and what topic you want to host and I'll put up a schedule. Great idea! Will surely send in my entry! Such a good event. I will definitely try to participate. Wow BangaloreBaker, nice theme, will surely make me too look into a book which I haven't done I don't know in how long. Thanks for this encouragement. Oooh, nice idea, BB. I love cooking from cookbooks too, or at least browsing through them. Will send you something. Fantastic event, i will definitely send my entries..
Wow! Thats a lovely initiative! I know what you mean. I get recipes from the internet, magazines and books. But my poor books sit and collect dust way too often. thats a gr8 idea for an event! Champa, I had a very similar idea for an event to conduct in my other blog. Great minds think alike, I guess. Wish I had read the rules earlier, because I posted a muffin recipe today but did not take the picture of the book. Returned it to the library. Thanks for the link Champa. That was a brilliant idea. Will send it soon.